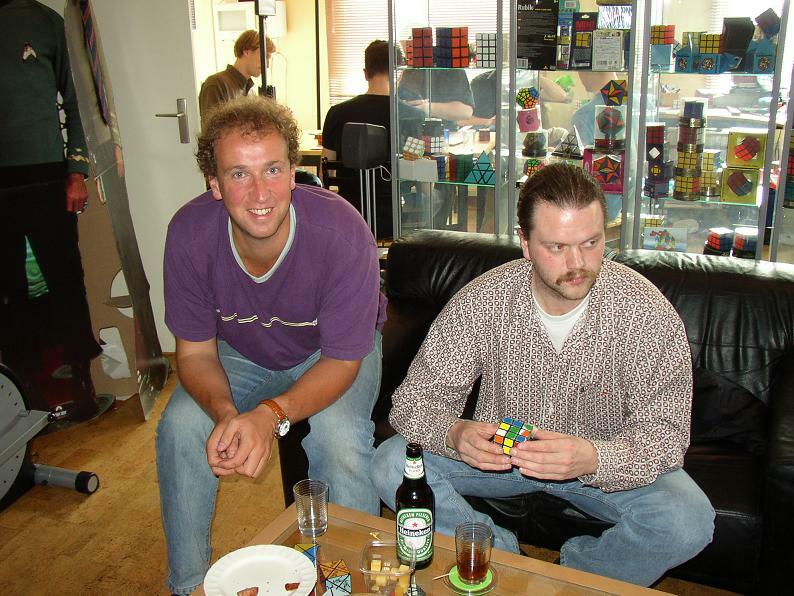 On sunday june 6, 2004 we had a nice cube meeting in Amsterdam at Ton Dennenbroek's place. It was an informal meeting with Ton Dennenbroek, Peter Jansen, Jaap Scherphuis, Koen Heltzel, Dan Harris, Ruben Geels, Joël van Noort, Stefan Bayens and Ron van Bruchem. We had a great afternoon with lots to talk about. 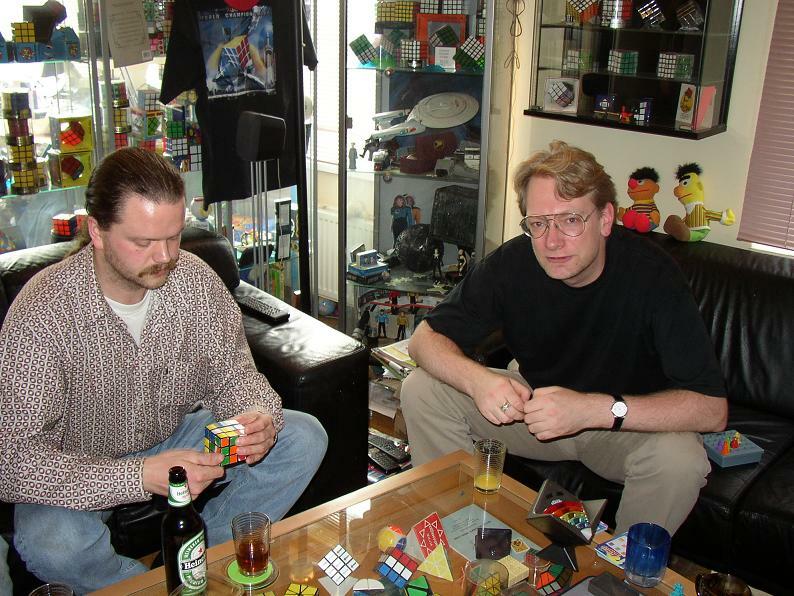 It is always nice to see Ton's huge collection of Rubik's puzzles. We also had a handicap competition, where the best cubers had to add a number of seconds to their average. Ton won the competition, setting 4 out of 5 times below his best average. Well done Ton! The fastest average was set by Ron with 17.83 seconds and a best time of 15.18 seconds. We all felt the pressure of competing, which is a good experience for the upcoming European Championship in Amsterdam. Below you can find some pictures and the full results of the competition. Dan Harris posted a report with pictures and videos. Koen Heltzel posted a report and a video in the Pictures section of his site. Joël, Ruben and Ton practicing. Koen, Joël, Ruben and Ton. Joël is a new speedcuber, who has been cubing for only 6 months, already averaging in the low 20's. He is still working on learning the OLL cases, but his F2L is fluent. Stefan and Peter. Stefan is a speedcuber from the 1980's. He restarted a year ago and he is improving fast again. Peter and Jaap. Jaap is a great puzzle solver and collector. Recently he started speedcubing for fun. He is the reigning world champion for Rubik's Magic, Rubik's Master Magic and Rubik's Clock. Since Toronto 2003 Jaap has improved a lot for all puzzles. Dan Harris competing. Dan was visiting The Netherlands where he was staying for the weekend at Ron's place. Dan and Ron had practiced all weekend for the European Championship. Peter, Dan, Joël, Ron and Stefan practicing. Format: 5 attempts, average of all but fastest and slowest attempt, handicap (based upon Unofficial World Ranking) added to average.